Catherine Ruth Mumaw of Harrisonburg, Virginia, died July 17, 2014, at her home. She was born July 22, 1932, in Harrisonburg, the daughter of John R. and Esther Mosemann Mumaw. She grew up in the Park View area, and attended Park School and Eastern Mennonite School and College. She earned a Bachelor of Science degree in home economics from Eastern Mennonite College, and Master of Science and doctoral degrees in family resource management from Pennsylvania State University. Her doctoral program was supported with a General Foods Fund Fellowship. Her professional career included teaching positions at Lancaster Mennonite School, Pennsylvania; Eastern Mennonite College (University), Virginia; Goshen College (Indiana); and Oregon State University. She also directed transcultural programs in Jamaica for home economics students. After her retirement she volunteered as an education advisor to Kathmandu University in Nepal. She was a loyal and contributing member of the American Home Economics Association (now the American Association for Family and Consumer Sciences) and of the state affiliates where she lived (Virginia, Indiana and Oregon). She joined the International Federation for Home Economics in 1967 and was active in leadership roles on the Executive Committee and a program committee. She also was a member of the American Association of University Women and Women in Development organizations. She was honored with memberships in Phi Kappa Phi, Omicron Nu and the Delta Kappa Gamma Society International. Other honors included the 1985 Indiana Home Economics Association Leader Award, the 1992 Family and Consumer Scientist in Community Service Award by the Oregon FACS, the 1994 Distinguished Faculty Award by the Oregon State Home Economics Alumni Association, and the Alumna of the Year Award 2006 by Eastern Mennonite University. She was a lifelong member of the Mennonite Church. She attended Harrisonburg Mennonite Church and was an active member of the Open Circle Sunday school class. 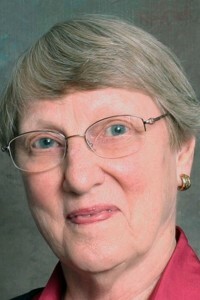 She served as a board member of Mennonite Mutual Aid (now Everence); Mennonite Economic Development Associates; Mennonite Community Association; and many Mennonite church committees. She also served on the boards of Indiana Partners of the Americas: Rio Grande do Sol; the Corvallis-Uzhhorod Sister Cities Association; and Solar Cookers International. Her hobby as a musician included the role of choral director of the ladies’ sextet and triple trio for the Mennonite Hour Broadcasts; of EMC Ladies’ Chorus; and RMH Nurses’ Glee Club. She sang in many choirs, including the Shenandoah Valley Choral Society, the Eugene Chamber Singers, the Camerata Singers, Goshen Community Chorus and the Kathmandu Chorale. Other hobbies included photography and travel to foreign destinations, including more than 40 countries and all continents. On Oct. 14, 2005, she married Clair L. Basinger, who survives. She also is survived by four stepdaughters, Eileen Smith of Waynesboro, Virginia, Carolyn (Al) Wheeler of Stuarts Draft, Virginia, Darlene (Dan) Harman of Weyers Cave, Virginia, and Debbie (Glenn) Bollinger of Bridgewater, Virginia; nine step-grandchildren, Tracy (Jennifer) Smith, Tonya (Merle) Swarey, Rhonda Scott Fitzgerald (Dusty), Ryan (Darby) Deming, Renee (Jason) Miller, Nathan and Zachary Harman, and Andrew and Joshua Bollinger; and 13 step-great-grandchildren, Levi, Jeremy, Aaron, Daniel and Joshua Smith, Seth Swarey, Dakota and Delanie Miller, Tyler Scott, Kolby Powell, Dakota Boyers, Cheyenne and Montana Deming. Three sisters survive: Grace Mumaw of Harrisonburg, Lois (Emanuel) Martin, also of Harrisonburg, and Miriam Mumaw of Arlington, Virginia. She was preceded in death by a sister, Helen (Laban) Peachey and a stepson-in-law, Cleo Smith. Three nieces and three nephews survive with their families, as do numerous cousins and friends. A service of celebration took place Tuesday, July 22, 2014 at Harrisonburg Mennonite Church. A private burial will take place at the Lindale Mennonite Church cemetery. In lieu of flowers, memorial contributions can be made to the Mennonite Central Committee, P.O. Box 500, Akron, PA 17501-0500; or to Eastern Mennonite University for the Catherine R. Mumaw Endowed Scholarship Fund (for international students), 1200 Park Road, Harrisonburg, VA 22802. Online condolences can be sent to the family at www.mcmullenfh.com. I extend deepest sympathy. Catherine was on the faculty as I also got my B.S. in Home Economics Education at Eastern Mennonite college. She left a profound mark on all of us as we went through Home Management House, graduating in 1969. I am still teaching FCS! I am so glad I was able to have breakfast with her, Harriet Steiner and Ruthanne Heatwole in this last year in Harrisonburg. We had a lovely time visiting. Mim, it would be wonderful to see you again, I have so many fond memories of you and the cheerleading squad and still see your vibrant smile and the sparkle in your eye. May the Lord bless you and keep you, make His face shine upon you and give you peace.